In vacuum casting, what are the different stages of production? The vacuum duplication process makes it possible to create multiple plastic parts using a silicone mould. First, it is necessary to create a master part from the 3D files of the prototypes to be produced. The latter is created either with stereolithography or CNC machining. Then the mould is created from this master part. Once the mould has been designed, the material is injected inside. This is then dried in an oven. The cured part is removed from the mould. The process is repeated as many times as the mould allows. The mould has a limited number of uses and a lifetime of about 40 days. It is then necessary to design a new mould. The complexity of the parts also affects the quantity of parts the mould can create with vacuum casting. From how many parts is vacuum casting generally more financially attractive than CNC machining? Vacuum casting results in significant economies of scale. It is recommend to use this prototyping technology for quantities exceeding ten pieces. From this number, the cost of creating the silicone tooling is paid off and the technology of vacuum casting generally becomes more attractive than CNC machining. The tooling consists of a master part and a mould. The economies of scale generally reach their maximum from 100 to 200 prototypes. Beyond this quantity, it is recommended to design an injection mould from aluminium or steel. Time during which the machine(s) are requisitioned. Time spent by the operator on the machine or on finishing the parts (polishing, painting, etc.). These economies of scale are lower than those of vacuum duplication. In addition, vacuum casting or vacuum duplication allows faster production than CNC machining for quantities exceeding ten. Which materials are suitable for making transparent parts? For prototyping projects using vacuum casting or vacuum duplication, there are multiple transparent materials with different properties. They are selected according to the specifications of the parts. It is difficult to create an exhaustive presentation of all solutions. Nevertheless, some possible solutions are discussed below. For example, PMMA PU offers greater transparency than PU PC but lower strength. PU PC is therefore recommended for parts requiring transparency and strength. References Px5212 and PX5213 from Axson are recommended for the production of coloured transparent parts. The desired shade can be obtained with the use of dyes. In addition, materials 8744 and 8743 from Heicast (imitation PMMA) allow the production of transparent coloured parts that retain their hues and geometry over time in contact with UV (solar rays). 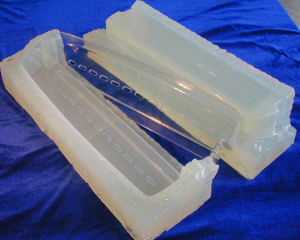 The material T0387 from Heicast is recommended for translucent and flexible parts. It makes it possible to obtain a Shore of between 80 and 30. However, certain shapes increase the risks of deformation and breakage. Send us your 3D files and we will inform you of any risks of deformation/breakage. I would like to make a prototype bottle out of T03B7, what is the recommended minimum wall thickness for this material? I can send you a part file for consultation. Please specify what format is preferred. For this material, we recommend a minimum wall thickness of 1.5 mm. For the part file, we prefer to work on STEP format.